A lot has happened since 1918, when Effie Ballou began preparing soups and doughnuts at her home on Route 302 and selling them out of a snack bar on the front lawn. But that early version of the Wayside Restaurant & Bakery, which she soon moved inside, is not so different from the much-expanded eatery on the busy Barre-Montpelier Road. Only the faces have changed at the horseshoe-shaped counter that fills up as early as 6:30 a.m. with members of "Counter Intellegence," a loose club that comes and goes throughout the day — the misspelling is intentional. As the morning progresses, the big booths around that counter fill up with salt-of-the-earth Vermonters who appear to appreciate a taste of history. One regular says he and his bride have been coming since 1955 for the ham and pea soup. Others step in for the honeycomb beef tripe. Made from the first three chambers of a cow's stomach, the dish is assuredly not for everyone, but owner Brian Zechinelli says diners come from all across Vermont to try it. The organ is marinated in vinegar, then battered and fried. The final product is the meat equivalent of a salt-and-vinegar chip, crispy on the outside and marshmallow textured on the inside. Yankee classics like salt pork and milk gravy draw a crowd on Thursdays. There's a hot market for the gravy-drenched chicken-fried fatback dish, some of which gets transported to appreciative eaters in several nearby nursing homes. Many probably frequented the Wayside before I-89 reached Montpelier, in the days when truckers traveling between Canada and New Hampshire ringed the counter. 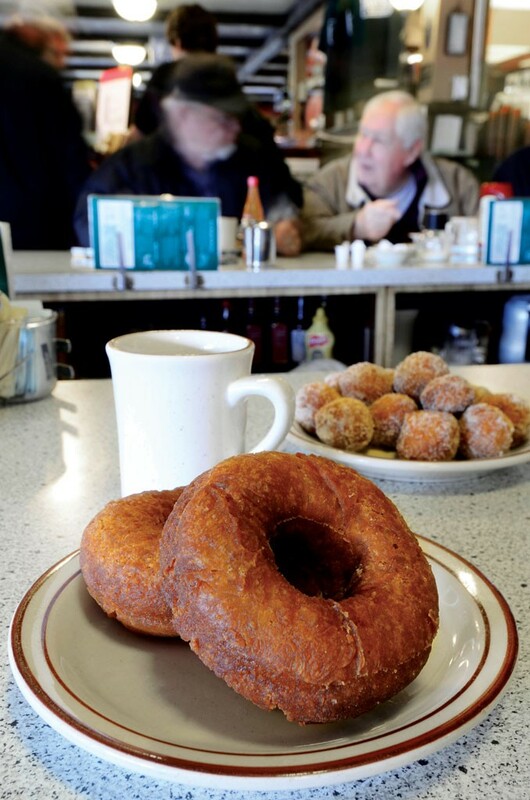 Then and now, no meal at the Wayside is complete without one of the diner's famous desserts. Doughnuts, probably not too different from the original recipe, still sell for less than a dollar. A hot, boozy chocolate pudding is known as the Kentucky Derby. One server describes it as "everything that's good," and she's not wrong. The same compliment could be paid to the "Soon to Be Famous Chocolate Cake," with its moist layers covered in dense ganache. Perhaps the food is heavier than some younger folks are used to, but portions are small, and the calories get farmers through the day. Effie Ballou wouldn't have had it any other way.